One of the claims of the pseudo-salafi movement is that Imam An-Nawawi was not an Asha’ri in creed. This is yet another example of their attempt to rewrite history to be in their favor. Before we prove that Imam an-Nawawi (rahmatullah ‘alayh) was an Asha’ri, we must first analyze why the pseudo-salafis would make such an unprecedented claim. Imam An-Nawawi is a Mujtahid in the Shafi’i school, having the most authority after Imam ash-Shafi’i! Imam An-Nawawi is respected by all Sunni ‘ulama‘, and indeed even non-Sunnis. His books are read, memorized, and preserved by each generation after him. He is, arguably, one of the most remembered and well-known scholars of the entire Muslim ummah. His commentary upon the Sahih Muslim is considered by many to be the best ever done in Muslim history, his Majmu‘ is considered only challenged in status by Ibn Qudamah’s Al-Mughni. If the pseudo-salafis can claim him to be an anthropomorphist and inline with their literalist views in creed, they have on their side a highly respected scholar, of whom no disagreement exists regarding his high status in Islam. It is for this reason that the deviant pseudo-salafis will do anything they can, especially lie, to claim Imam an-Nawawi as one of “them“. “…An-Nawawee is not accepted in aqeedah. One of hte [sic.] principles in the extraction of aqeedah is that there [sic.] views mirror the views of the predecessors. If there is a lack of congruity between the articulator and what has been established in unequivocal terms by the predecessors, then this disqualifies the person as being an authoritative figure by which their statements can be accepted in whatever field be spoken about. Thus ahlu-sunnah reserve an-Nawawee and utilize [sic.] him in hwere [sic.] he specialized in i.e. fiqh, usoolul-fiqh, lugha, shurooh of hadeeth, uloomul-hadeeth, and the basics of tassawwuf, but not in terms of al-Asmaai wa Sifaat. 1) Imam an-Nawawi is not quoted in ‘Aqidah because, as he claims, he is not inline with the method of the Salaf us-Salih in creed. Or in other words he is not inline with what the commenter believes is the creed of ahlus Sunnah! Imam An-Nawawi refutes this claim himself as you shall come to see. 2) That An-Nawawi “refuted” kalam/’ilm-ul-kalam. He argues that an Asha’ri can only adopt the way of “kalaam” in order to be deemed an Asha’ri. This is not entirely true either, as there are two well-known schools (methods) of the Asha’ris in dealing with the attributes of Allah. There are three ways to determine the status in creed of Imam an-Nawawi. 1) Analyze what his contemporaries, such as his students, comrades, co-teachers etc. said regarding him. 2) Analyze what the scholars after him said regarding his creed and status amongst the Sunnis. 3) Review his works and determine what he said regarding kalam. This will be the method of this article. He also reported the many books of hadith to his students as narrated by Ibn ‘Attar. There was agreement in his time regarding his Imamship and his knowledge, unlike what the pseudo-salafis would have us to believe – that he is not to taken from in issues of creed – yet here ibn ‘Attar is making it very clear that there was ittifaq (agreement) of the scholars regarding his knowledge, and so he was trusted and taken from. This point will be further elaborated upon further down. That he learned and taught kalam ((see the introduction to Kitab At-Tahqiq published by Dar Al-Jil page 18 )) and logic (mantiq), a fundamental of Sunni Kalam. Within the Sunni school, no one could teach this science if he was not knowledgeable and well rehearsed in the subject. This refutes the assertion that he was not knowledgeable in the field of kalam! Imam An-Nawawi was given the title of “Shaykh ul-Islam” by his students, comrades, and those Imams after him. The title Shaykh ul-Islam is of import to this discussion because it denotes that he mastered all of the sciences of Islam and if such is the case, then the argument of the pseudo-salafis that he is not taken from in creed is rejected by the scholars, for his status denotes that he is to be taken from in all matters. We should note here that we are arguing for “agreement” of the Muslims regarding this title. It is true that some individuals overly praise certain Shuyukh with this title, as Imam as-Sakhawi points out, and they do not meet the criterion for this honorific. 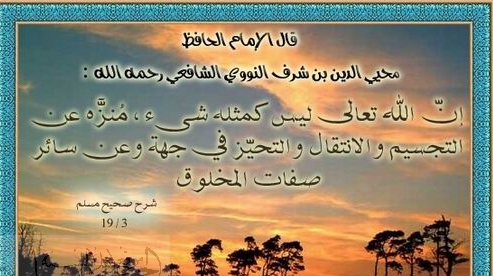 Imam Muhammad Al-Wasiti also mentions what Ibn Al- ‘Attar mentioned of his many classes he had within a day, except that he clarifies that in Usul al-Fiqh he would review al-Luma’ of Abi Ishaq and the Muntakhib of Imam Fakhrud-Din ar-Razi, and in Usul ad-Din he would go over the Irshad of Imam al-Haramayn al-Juwayni! The Irshad’s title is: الإرشاد إلى قواطع الأدلة في أصول الاعتقاد al-Irshad ila qawati’ Al-Adillat fi Usual al-‘Itiqad. The Irshad is a work of Sunni Kalam theology by one of the heads of the Asha’ris, Imam Al-Haramayn Abdul Malik Al-Juwayni, a book mastered, taught, and propagated by Imam An-Nawawi within his circles of knowledge. Imam an-Nawawi learned and taught Asha’ri texts, specifically from Imam al-Haramayn, and received ijazaat (permission to teach others). This is clear proof that he supported the Asha’ri school, as he could have easily learned and taught other works. He had mastered Kalam, as teaching the Irshad certainly takes a Mutakallim to teach correctly! Hence he was relied upon in ‘Aqidah [by the masses of Muslim in his time, as they did not object to him teaching these works, and he (rahmatullah ‘alayh) was clearly promulgating the positions of the Asha’ri school. He was a master of all the sciences of religion, including Usul ad-Din, and here we are referring to Tawhid, or what is commonly called ” ‘Aqidah”. This point squelches the argument of the pseudo-salafis that he is not to be trusted in this science. He was labeled “Shaykh ul-Islam” by his contemporaries, students, and those after him. Others who gave him the title “Shaykh ul-Islam” include but are not restricted to, Imam as-Sakhawi ((Hayat Al-Imam an-Nawawi )), Imam Suyuti [who was given the title by others as well] ((See his Minhaj as-Sawi )), Imam as-Subki in his Tabaqat, Ibn Qadi Shuhbah, and many others. Imrar passing the texts on as they have come) and relegating the knowledge/meaning of the texts to Allah, while denying anything that would not befit Allah, such as the likenesses of created attributes, anthropomorphism etc. This method is generally known as tafwid. Ta’wil which is to interpret the texts that are problematic in the sense that they literally seem anthropomorphic, while having precedent in the language of Arabic to do so. Imam An-Nawawi (radiya Allahu ‘anhu) followed both of these paths and stated that both of these paths were the way of the salaf (predecessors) with regard to the texts. He NEVER stated that the literal meaning was intended by these texts, as the pseudo-salafis say, and he even denied such as you will come to know below. You will also see further down that Imam An-Nawawi adopted the kalam method in refuting the anthropomorphists by using their creedal nomenclature and rational proofs. هذا الحديث من أحاديث الصفات، وفيه مذهبان مشهوران للعلماء: أحدهما وهو مذهب السلف وبعض المتكلمين أنه يؤمن بأنها حق على ما يليق بالله تعالى وأن ظاهرها المتعارف في حقنا غير مراد، ولا يتكلم في تأويلها مع اعتقاد تنزيه الله تعالى عن صفات المخلوق وعن الانتقال والحركات وسائر سمات الخلق، والثاني مذهب أكثر المتكلمين وجماعات من السلف وهو محكي هنا عن مالك والأوزاعي على أنها تتأول على ما يليق بها بحسب مواطنها، فعلى هذا تأولوا هذا الحديث تأويلين أحدهما: تأويل مالك بن أنس وغيره، معناه تنزل رحمته وأمره وملائكته، كما يقال فعل السلطان كذا إذا فعله أتباعه بأمره، والثاني: أنه على الاستعارة ومعناه الإقبال على الداعين بالإجابة واللطف. This hadith is from the hadith of the Sifat (of Allah), and regarding it there are two well known madhdhabs: the first, and it is the madhhab of the salaf and some of the Mutakallimin (scholars of kalam) that it is believe in their [i.e. the attributs] reality according to what befits Allāh ta’ala, and that the literal meaning that we commonly apply to ourselves is not what is meant, and that one does not speak regarding its interpretation while holding the belief that Allah ta’alā is free from the attributes of the created, and from translocation, and movement, and the rest of the attributes of created beings. The second is the madhdhab of the majority of the Mutakallimīn, and a group from amongst the Salaf, and it is what is reported from Mālik and al-Awzā’ī that they are interpreted figuratively but only according to their appropriate contextual meanings. On this basis there are two interpretations (ta’wils). The first is the ta’wil of Imam Malik ibn Anas and other than he, that its meaning is the descent of His mercy and decree and His angels. [as is said regarding the Sultan …] and the Second interpretation is that it is an Isti’arah (metaphor) to signifiy turning to (iqbal) to those who supplicate to Him with fulfillment by answering [the du’aa] and showing lutf (kindness, generosity) [to those beseeching Him]. Take notice that Imam an-Nawawi denies the literal meaning, the method of the pseudo-salafis, for Allah’s descent, and says the way of the salaf and the Mutakallimin is both tafwid and ta’wil. Notice here that he is only adopting the two methods of the Asha’ris and denying any other madhdhab in this matter, as he states there are “two madhdhabs”, in other words, and no more! هذا الحديث من أحاديث الصِّفات، وفيها مذهبان تقدَّم ذكرهما مرَّات في كتاب الإيمان: أحدهما:الإيمان به من غير خوض في معناه، مع اعتقاد أنَّ الله ليس كمثله شيء،وتنزيهه عن سمات المخلوقات.والثَّاني:تأويله بما يليق به. فمن قال بهذا – أي التأويل – قال: كان المراد امتحانها هل هي موحِّدة تقرُّ بأنَّ الخالق المدبِّر الفعَّال هو الله وحده، وهو الَّذي إذا دعاه الدَّاعي استقبل السَّماء،كما إذاصلَّى المصلِّي استقبل الكعبة،وليس ذلك لأنَّه منحصر في السَّماء، كما أنَّه ليس منحصراً في جهة الكعبة، بل ذلك لأنَّ السَّماء قبلة الدَّاعين، كما أنَّ الكعبة قبلة المصلِّين.أو هي من عبدة الأوثان العابدين للأوثان الَّتي بين أيديهم، فلمَّا قالت: في السَّماء علم أنَّها موحِّدة وليست عابدة للأوثان. Again, Imam an-Nawawi makes no mention of the madhdhab of the literalists who delve into the literal meaning and affirm it for Allah! He is stating here the two schools of the Asha’ris! This is the exact wording of the Asha’ris within their texts when talking of Allah. Such stupidity only shows the ignorance of Ibn Taymiyyah in issues of creed! “The Book” does say He is not a body when He says “There is nothing like unto Him, and He is As-Sami’ al-Basir!” This is a verse of denial of everything in similitude with creation! For jism (corporeality/body) is an attribute of the created, and is thus tamthil. Allah never ascribes himself with a body (jism), yet Ibn Taymiyyah is more than happy to do so for Him, exalted is He above what this deviant ascribed to Him! Ibn Jahbal refuted such kufristic insinuations in his refutation of Ibn Taymiyyah that has been translated and published and this paper’s goal is not to discuss this matter. However, take note that even Imam An-Nawawi disagreed with Ibn Taymiyyah, and this is a clear refutation of the claim of “Ijma’” by Ibn Taymiyyah in the quote above. So the Qur’an does say He is not a body. But a question to ask the proponents of Tajsim (and this is what it is): Where does Allah ascribe to Himself a “body”? What proof do you have? Or is it that you do take the literal meaning of hand, shin, waist, foot, eyes, and with your sensual perception imagine Allah as the pagan Christians do as a body (jism), unlike other bodies – in other words with a bigger hand than humans. These folk have invented a lie upon Allah by saying about Him what He has denied about Himself! Imam An-Nawawi is the complete opposite in creed of Ibn Taymiyyah. In fact, Imam An-Nawawi does not even recognize the school of Ibn Taymiyyah as being from Ahlus Sunnah, as you can see from his commentary in Sahih Muslim, rejecting the “literal” meanings as what is intended. He also denies the literalists’, such as Ibn Qutaybah, approach to this hadith. Notice he utilizes the Asha’ri Sunni kalami argument that an image necessitates tarkib, and anything that has tarkib is muhdath, and Allah ta’ala is not muhdath. This is a rational Kalami argument that is proof against the anthropomorphists, and is utilized here by Imam an-Nawawi to refute such creedal impudence! Another clear text from Imam An-Nawawi professing the Asha’ri doctrine with regards to the attributes of Allah is what he said in his masterpiece “Majmu[‘”. Hulul is indwelling or incarnation of the Divine into a created being, place, or quality. Here he also states the two schools of the Asha’ris as well, that of tafwid and that of ta’wil, while denying the literal purport of these texts. Notice here that Shaykh ul-Islam Imam an-Nawawi deems the school of the righteous Salaf the path of tafwid, not the path of literalism! He deemed this madhdhab the madhdhab of the hadith and the Sunnah in the issues of kalam, an obvious praise for the madhdhab of the Asha’ris! إن مذهبه في الصفات السمعية السكوت ، وإمرارها كما جاءت ،وربما تأول قليلاً في شرح مسلم. We came upon an article that presupposes that Imam An-Nawawi (rahimahullah) was not an Asha’ri because he criticizes some of the Mutakallimin that argue that one must use Kalam to arrive at knowing Allah. Imam An-Nawawi slams this position, no doubt, and says it is not the majority position. However, in his condemnation of those Mutakallimin who hold this view, is proof that Imam an-Nawawi considered himself an Asha’ri and a Mutakallim. He deems here the “Mutakallimin” as those who are “our companions”. Imam an-Nawawi in his Majmu’ uses “As-habnaa” to refer to those of his same madhdhab, that of the Shafi’is, and he is doing the same here! This is clearly an ascription of Himself to the same school as they are upon, the school of Kalam! This is inline with what we have forwarded throughout this article; that he taught the works of Kalam, quoted them, endorsed the Asha’ri and Kalam methods in his Sharh of Sahih Muslim as well as within his Majmu’ when discussing how the Sunnis treat the issue of Allah’s attributes. He is, undoubtedly, as professed by Imam al-Yafi’i and Taj As-Subki, an Asha’ri! All of this is clear proof that the pseudo-salafis have lied upon Imam An-Nawawi – just as some of them took out entire sections from his works such as his Adhkaar! Such is necessary for them, considering the Imams of Islam do not hold to their creed, and so they must distort the Imams’ states in order to justify their anthropomorphic tendencies! And as Allah has said: the curse of Allah is upon the liars! Imam an-Nawawi, just as Imam al-Ghazzali, warned the laity about delving into kalaam, unless a doubt were to raise in their minds regarding it. He said as translated by the Asha’ri and Sufi, Shaykh Nuh Keller in his “Reliance of the Traveller”, “A:” in brackets is the commentary of Shaykh Abdul-Wakil Durubi. His other statements expressing the same meaning are numerous and well known. But if someone has doubts (Allah be our refuge) about any of the tenets of faith in which belief is obligatory (def: books u and v), and his doubt cannot be eliminated except by learning one of the theologians’ proofs, then it is obligatory for him to learn it in order to remove the doubt and acquire the belief in question. So when the need arose, Imam An-Nawawi not only recommended Kalam, but he deemed it wajib – an obligation! Let those who say Imam An-Nawawi was not an Asha’ri take heed of this point: He obligated the Sunni Kalaam of the Asha’ris when it was needed, so how could he deem it to be falsehood if he deemed it obligatory based upon the need? In other words, Imam An-Nawawi was an Asha’ri, supported the madhhab, utilized its proofs in his works, quoted from its scholars, and held that it was necessary to learn the arguments if need arose. To read more on Kalam and Islam see this article. And with Allah is our Supreme Success! And May Allah send his blessings upon the Prophet Muhammad, his family, and his followers! Amin!